The Daily Collegian’s front page from Monday, Oct. 14. Yeah, I spent part of my Sunday night rewatching the four-overtime victory over Michigan. You could argue that it was my first time really seeing what happened—I was standing at the back of the opposite end zone when Bill Belton scored the winning touchdown, so I didn’t have the best view. And given how tall the lettermen standing around me were, even though I was on the same side of the field as Allen Robinson’s catch, I didn’t have a great view of that, either. “Epic:” That’s the adjective Belton used when he tweeted this video of his touchdown run, filmed by Tim Owen ’11 of Blue White Illustrated, who was standing in exactly the right place. The post-touchdown celebration footage is entertaining, too. Over and over: Can’t get enough of Allen Robinson’s catch? Or Belton’s run? That’s why someone invented GIFs. Click here to watch Robinson, and you’ll see why his catch was the No. 1 play on SportsCenter on Saturday night. And click here to watch Belton from a cool, overhead angle. 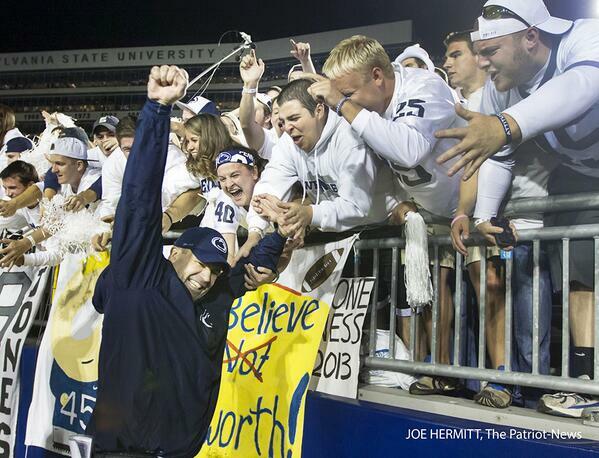 “I don’t think I’ve ever been more excited to hug a large, sweaty man:” That’s Onward State’s Kevin Horne, recounting his evening in the student section. Lots of fun observations in this piece. Joe Hermitt tweeted this photo with this intro: You think the win over Michigan meant a lot to #PennState coach Bill O’Brien? I’d say so. How loud is a Whiteout? Patriot-News photographer Joe Hermitt pulled out his Decibel 10 app to see exactly how loud it was Saturday on the field. Among his comparisons: a chainsaw, a pneumatic drill, being 300 yards away from a jet engine. Check out his video here. And of course his photo above. Best Beaver Stadium game ever? Mike Poorman ’82 of State College.com (and the College of Communications) thinks it was. But he consulted with a couple of experts—Fran Fisher and Lou Prato ’59, and they’re holding out for the 1982 Nebraska game. What do you think? Check out Poorman’s list of the 10 top Beaver Stadium games and let us know your vote in the comments. If you still didn’t get enough: The game will be rebroadcast at 8 p.m. Eastern time tonight; it’s ESPNU’s College Football Game of the Week. Of course. P.S. A lot of other stuff happened over the weekend. The Pegula Ice Arena was christened, and the first game there was a resounding success (more coming later from our Tina Hay, who was there with her camera). THON revealed its 2014 theme: Redefine the Possibilities. And Science World Report published a story that will be of particular interest if your weekend was anything like mine: Penn State researchers looking into whether you can “make up” for lost sleep.